Calendar Card: 2 1/8" x 3 3/8"
Calendar card is made with standard gloss laminate on both sides. Calendar printed on one side, custom copy on reverse side of the card. 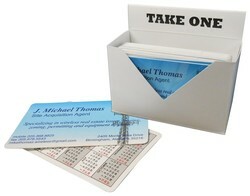 Pricing includes custom four color process imprint on both sides of the card. Start calendar with any month, highlight holidays, paydays or any special events for no additional charge. Cards come shrink wrapped in increments of 100 per dispenser box. Dispenser boxes are printed in black ink with stock copy "Take One".